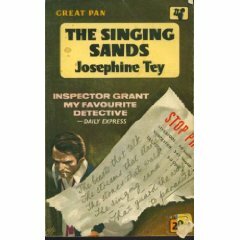 I first bought one of Josephine Tey’s books after reading Julian Symons’ Bloody Murder in which he talks about compiling for a Sunday paper a list of the Hundred Best Crime Stories . He consulted several critics for their recommendations and it was the lover of detective fiction, Howard Haycraft, who asked that Tey’s The Daughter of Time (1951) be included. 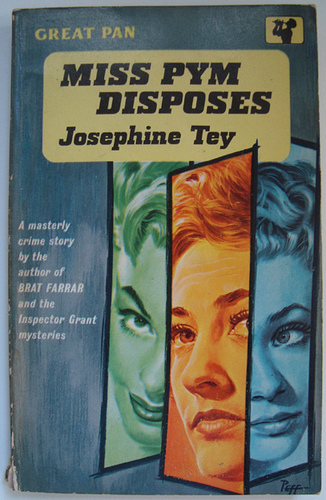 Symons comments that JosephineTey did write some original stories but that his choice would not have been Haycraft’s. Symons preferred her book, The Franchise Affair. Following Symons’ advice I read it and was hooked. 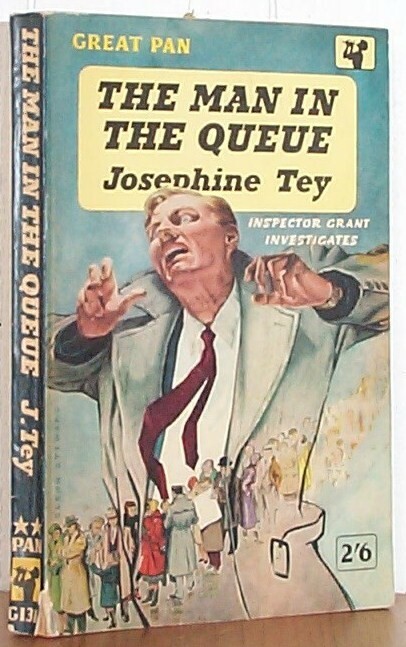 Of course, certain attitudes revealed in her early novels would no longer be tolerated, for example, her use of the word ‘dago’ in her first Inspector Grant novel, The Man in the Queue. Grant assumes that because the man in the theatre queue has been stabbed with a small ‘viperish’ blade the murderer must be a dago. But Josephine Tey is special. Each mystery is fresh and new whether it features her detective, Inspector Grant, or in what would today be called a stand alone. Her plots are interesting, the mysteries difficult to solve, her settings varied and beautifully described, the characters well drawn and her writing elegant, witty and pleasing. Elizabeth Mackintosh was born in Scotland and her love of her native land is apparent especially in The Singing Sands when she takes a tired and ailing Inspector Grant to stay with his cousin’s family the Highlands for a healing fishing holiday. But she has no truck with jingoism. In the same novel she makes fun of those who preach independence for Scotland by inventing a loony character, Wee Archie, a self-styled saviour of Scotland who rants at Grant mistakenly believing him to be English. Grant, himself, is an interesting character. Like many of the thirties sleuths, he is brave, a bit of a toff, well educated, liable to quote from the classics and appreciative of men and women of breeding. But he does have some more unusual and endearing qualities. When he inherited a large amount of money he used some of it to set up a released prisoner in a small shop so that he might never sin again. He is kind, loved by his small nephew and admired by Williams, his faithful sergeant. But his main quality is his humanity and hatred of injustice. In The Man in the Queue, through dogged and careful police work he catches the man he believes to be guilty of murder but, once he has listened carefully to his story he begins doubting whether or not he has caught the right man. The fallibility of evidence is a theme dear to Tey’s heart. Grant’s honesty and his conscience prompt him to go on working at the case rather than risk causing an innocent man to be hanged. 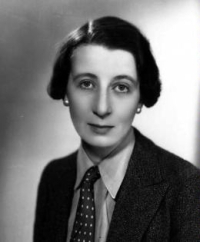 Another of Josephine Tey’s favourite themes is disguise and deception. In The Franchise Affair, an innocent looking schoolgirl accuses two women of abducting her and keeping her prisoner in the attic of their isolated country house, The Franchise. They beg for help from a solicitor who, in spite of his misgivings, becomes their friend and protector. The mystery revolves round the power of the spiteful popular press, enemy of truth and justice, and ends in a brilliantly staged trial. How can the child be telling lies when she can describe so accurately the house and its garden? For this plot Tey used the true story of an eighteenth century woman, Elizabeth Canning, who claimed that she had been kidnapped, locked away for weeks and and ill treated before making her escape. Although they may have certain themes in common every book is a surprise. Brat Farrar is the fascinating story of a man fraudulently claiming to be someone else in order to inherit wealth and position. Each member of the family he tries to deceive is beautifully drawn from the young twins to the tough young woman he falls in love with. The background of stables, race meetings and horses is convincing. You don’t need to be a lover of mysteries to enjoy this novel and warm to the characters. By some extraordinary feat, Tey has the reader sympathising with the deceiver and wanting his lies to convince. Brat is a charmer but one of my personal favourites is Miss Lucy Pym, the star of Miss Pym Disposes. Because of the extraordinary success of her book on psychology, Miss Pym is able to give up her day job and spend some time visiting a former school friend, now the principal of a women’s physical training college. Josephine Tey’s familiarity with such an establishment allows her to paint a telling picture of the tension and fatigue experienced by the young women in the run up to their final display and examinations. 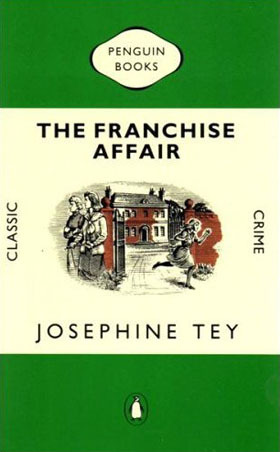 It ends in tragedy but Josephine Tey makes natural justice overshadow the law. Little Miss Pym, a kindly, self deprecating soul with a ‘face like a scone’ makes the right decision. There are some writers who bring out a book each year, some better than others. I wish that Josephine Tey had written more than these eight but it seems that she rated her plays much higher than her mysteries. In one of her novels she even has a playwright talking scornfully of her detective stories. Never mind. The few she did write are so good that they bear rereading time and time again.